and Michelle Hamilton (big glasses). 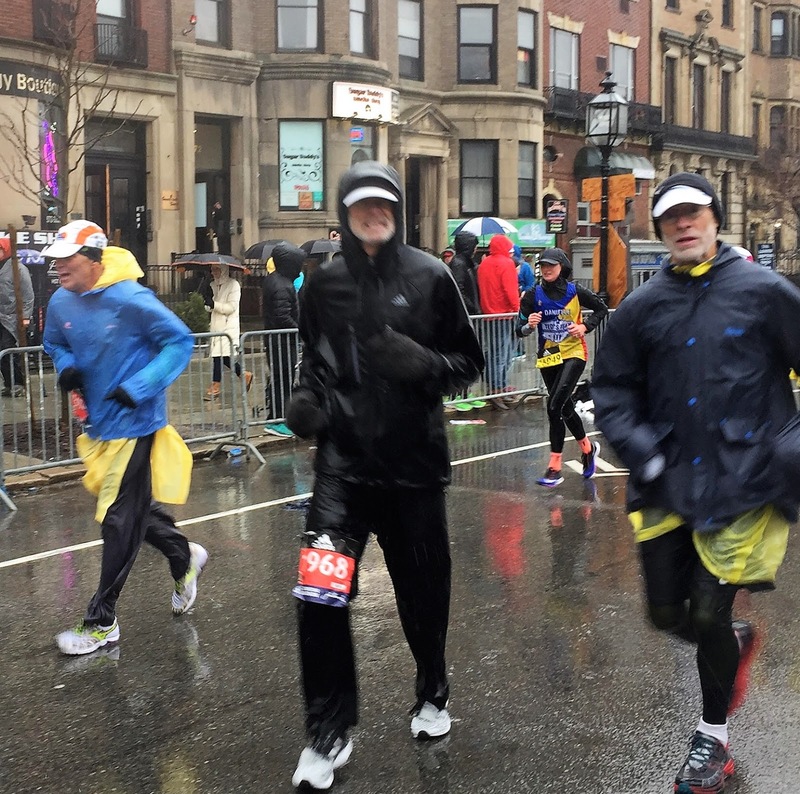 Several days before the 2018 Boston Marathon, we knew it would be a nasty one. We all saw it coming. No escape. 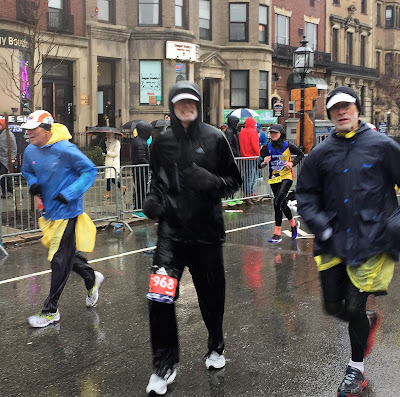 Then I heard Tom Grilk, the Boston Athletic Association’s CEO, quote a few lines from Shakespeare’s Henry V: “We few, we lucky few, we band of brothers...” I began thinking that perhaps I could improve upon the original. I’m sure I didn’t, but here’s what I came up with. 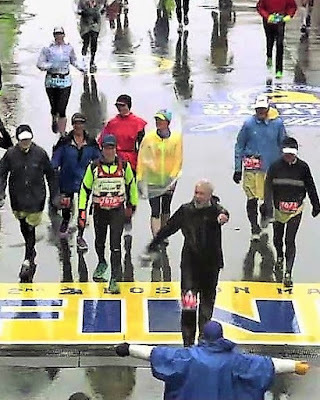 That they did not endure like us in Boston on April 16, 2018. On this 50th anniversary of my Boston win in 1968, I felt more determined than ever to cross the finish line. But I doubt I could’ve done it without the amazing team of eight who ran with me every step of the way. The weather put us all to the test, especially when we felt our core body temps dropping. # John Valentine was my first regular training partner back in the mid-1960s, and we have been running together ever since. A recently retired cancer doc from Vermont, John has run seven or eight Bostons with me. He reminds me constantly how amazing it is that we are still running marathons, and how fortunate we should feel. Indeed. # John’s daughter Megan has now finished five Bostons with me. She’s my favorite marathon pacer/cheerleader. There’s nothing she won’t do to help out en route. Monday, she sang and danced to keep our spirits up. When my brother, Gary, became hypothermic midway and seemed unlikely to finish, Megan scoured the roadsides until she found a heavy, mid-calf-length poncho that someone had discarded. She fetched it for Gary, helped him put it on, and he went on to finish strong. She also re-tied his shoelaces when his own hands were too frozen to function. # My brother Gary is a strong runner, but he’s never liked marathons. There’s too much that can go wrong over 26 miles, and he’s experienced his share of troubles. This year he trained well, with three 20-milers in one 12-day period at the end of March. I ran all three of those runs, though I stopped at 18 each time. 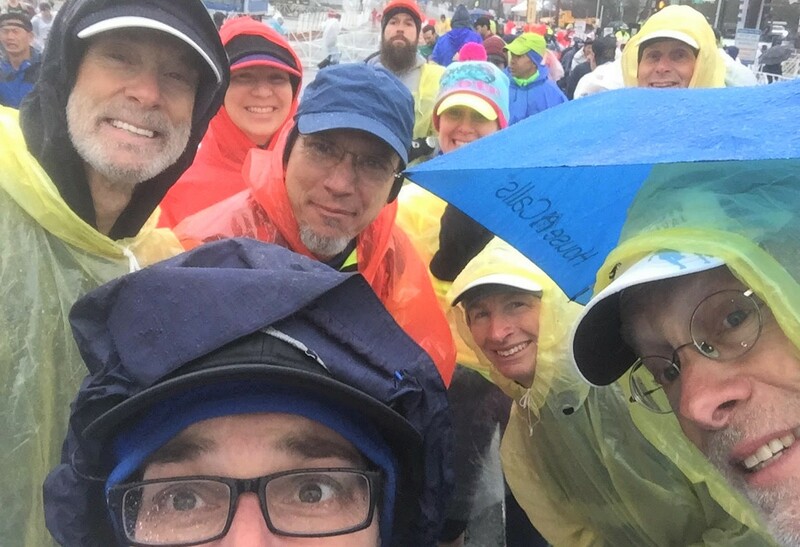 We’ve covered a lot of miles through the years, in a lot of different places and races, and have drawn strength from each other. Of course, we’ve also endured all life’s ups-and-downs for 70 years, and there’s no one else I’d rather have at my side. For life. # Michelle Hamilton has been my most frequent training partner the past three years in Mystic. I can keep up with her only on her easy days, but we make our schedules work. Michelle co-wrote Deena Kastor’s great new memoir, Let Your Mind Run. She almost missed Boston altogether because she had landed a dream writing assignment for Runner’s World on women runners in Saudi Arabia who have finally broken through cultural restrictions. # Ray Charbonneau is an email and in-person friend of the last five years. We share an interest in running, writing, publishing, and apparently math, since we recently launched a new website, MathematicalRunner.com. Ray was team captain on Monday, telling all of us when to start running, and when to take walk breaks. We followed a 4:1 ratio the whole way. His voice was loud and commanding, which kept us all on schedule. # Donna Smyers is a well-known runner and triathlete (frequent age-group winner in both) from Vermont, and a regular training partner of John Valentine’s. I see Donna every Thanksgiving Day when she returns home to Manchester, Connecticut, for the holiday. She’s a physical therapist from 9 to 5, and answered a few of my sore-muscle questions on the long road from Hopkinton to Copley Square. # Monday was the first time I met Leslie Welts, but I spent five hours envious over her relaxed but powerful stride. Leslie qualified for Boston with a 3:34, not realizing she was in the early weeks of her first pregnancy. Post birth, she moderated her training and decided to join us for a submaximal effort. She looked like she could have gone another 10 miles. Easily. Cristina with open arms at the finish line. From the beginning, I told our group that we were simply doing “a long, wintry training run.” Everyone agreed, and we held close together the whole way. At 10 miles I was wet and chilled and worried about hypothermia, which I knew could stop me from reaching the finish line. If the temperature had dropped a couple of degrees more, or the winds kicked up more, it could have been truly dangerous out there. Fortunately, the conditions were actually a little better than we had expected. After 10 miles, my temperature stabilized, perhaps because Michelle loaned me her mittens. Something that small might have made a big difference. After Heartbreak Hill, we all agreed to slow down a little, and make the final miles as comfortable as possible. In 1968, I had no time to savor the experience, to realize that I might win. Fifty years later, in 2018, I could relax and reflect. The whole last half of the race, I was looking forward to greeting my wife, Cristina, at the finish. It was one of my biggest motivations. We made arrangements with the BAA for her to get to ground level, but I wasn’t sure if the plans would work. I feared there would be so much mess and confusion at the finish, in the stormy conditions, that it just wouldn’t happen. But her force of will and quick action from two determined BAA staff members got her there just in time. 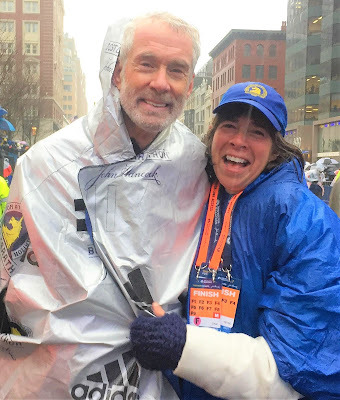 Cristina’s been at all my Boston finishes since 1988, and this time she was standing on the actual finish line. anything. Only rain and grayness. Then I did. I spotted her sparkling face, eyes, and smile beaming at me from inside a dark blue poncho. Her gaze struck me like a laser beam. It felt like the sun were suddenly shining. The closer we got, the bigger my smile spread, and the more I could see the tears in her eyes. It was the best hug ever. Every run is a new adventure. Every mile is a gift.